Continuity Programs offers a 100% turn-key e-mail marketing campaign for customer retention that is designed to generate leads, get referrals, up sell and cross sell your products and services, keep in touch with your past customers, and acquire new customers. All business ecards are personalized with your photo, company logo, and all contact information including your social media links. The ecards are sent from your e-mail address on your behalf. Each marketing e-mail includes an online lead generating response form, which provides valuable two-way communication between you and your customers. Our eConnections Program can stand on its own, but it can also be combined with our other programs for a comprehensive customer outreach strategy. 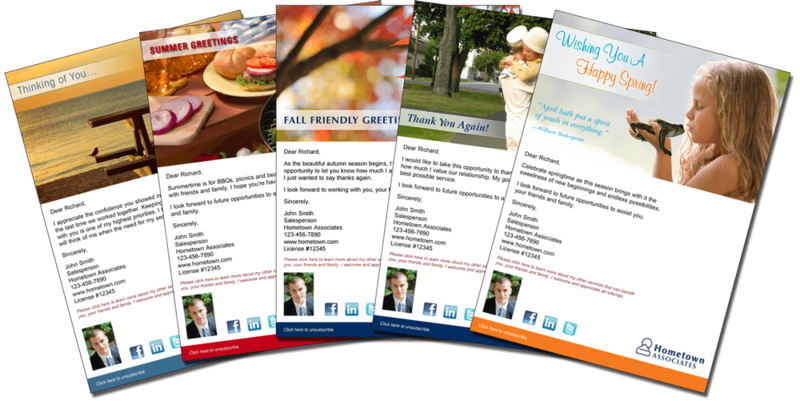 eCards, traditional mailed greeting cards, radius mailings, and more all work together to drive business from past customers, existing customers, and potential customers most likely to be interested in your products. No matter how busy you get, our e-mail marketing campaigns will help you stay in touch with your customers so you can concentrate on your current business activities.